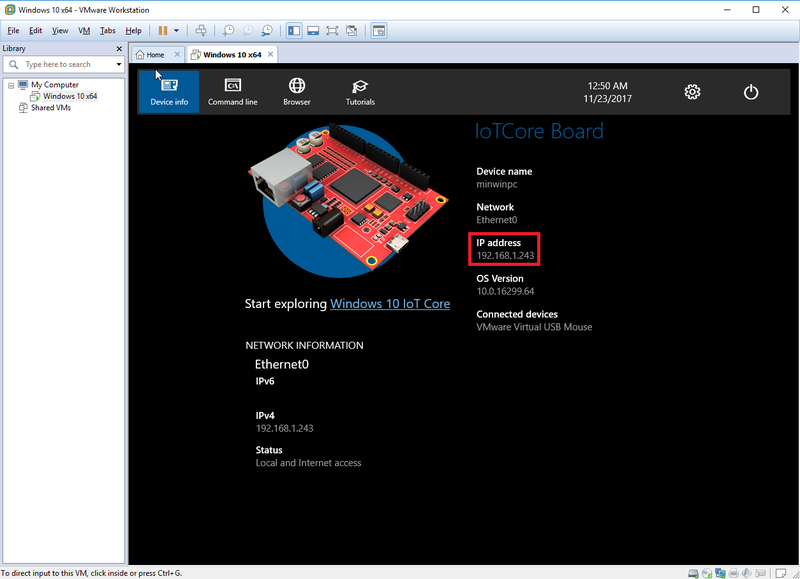 Moments after completing my last post I noticed IoT Core running in the VM reported it had no IP address. I initially assumed I just had to fiddle with the network adapter settings, but after dong that for a while it appears I can't get networking to work under VirtualBox at all! Rather than give up, I decided to give VMware a try. VMware doesn't seem to be able to work directly with the VHD image I'd created- instead expecting a VMDK. I thought Hyper-V could be used to do the conversion, but it's only able to create a VHDX. It looks like VMware's vCenter Converter should be able to do it, but I couldn't get that working. In the end winimage got the job done. Clicking through the VM setup I was again up and running with a working IoT Core VM. This time with networking. I've learned my lesson to not celebrate prematurely.